Featuring highly-advanced, powerful, precision technology, the LazerLift®represents a breakthrough in facial rejuvenation technology. Until now, the only way to adequately address aging-related changes in the lower face and neck was through surgical intervention that required invasive incisions and extended downtime. Traditional lifts involve the use of the scalpel, the need for stitches, and some level of scarring. On the other end of the spectrum, superficial resurfacing procedures only address surface concerns. Today, the LazerLift®offers a new, technologically advanced option for non-surgical facial rejuvenation. The LazerLift®can provide outstanding results through a minimally invasive procedure that involves no extensive incisions, no general anesthesia, and minimal downtime. Fast, convenient, and effective, the LazerLift®procedure can be performed in-office in as little as 30 minutes. Because there’s no need for general anesthesia, you’ll be awake and comfortable throughout your procedure. 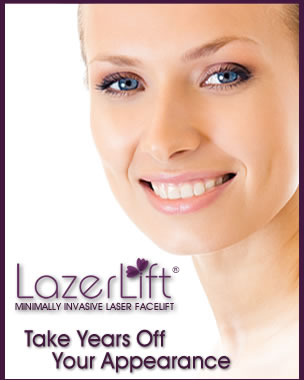 With LazerLift®, there are no extensive incisions or stitches needed. Your doctor will place three 1.0 mm micro-holes behind the ears and under the chin. Each of these micro-incisions is smaller than the tip of a ballpoint pen and will be unnoticeable once healed. * Numbing fluid is introduced through the entry points, working instantaneously to ensure your comfort throughout the procedure. 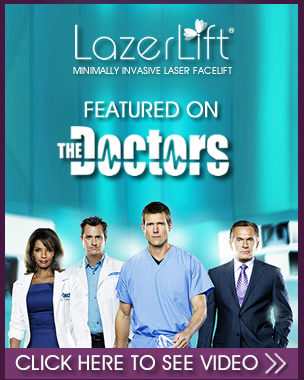 Only a handful of physicians have the advanced technology and expertise to offer the LazerLift®procedure. To find out more, fill out our request information form online. © 2019 LazerLift®LLC., All rights reserved. *Disclaimer: The information contained on this website is intended to be purely educational in nature and does not create a physician-patient relationship with LazerLift®LLC., its physicians, or any agent, servant or employee thereof. By no means should the information contained in this website be considered as a substitute for consultation with a qualified physician and it does not constitute a second opinion. This website and its contents do not represent or claim to provide the information needed for a patient to give his or her informed consent to any surgical procedure or are a reflection of individual patient results, as they may vary patient to patient. Individual results will vary and no guaranteed result is stated or implied by any photo use or any statement, testimonial, or video on this website. The results depicted in “before” and “after” pictures and stated by any “patient testimonial” illustrate results you may or may not achieve if you choose to have a cosmetic surgery procedure. Individual results may vary by patient.